Cloudinary helps thousands of websites and mobile applications to manage and deliver billions of images, video, and other media files. · Explore and evaluate new JS technologies and frameworks to identify the next top-notch technology and provide a solution ahead of the market. 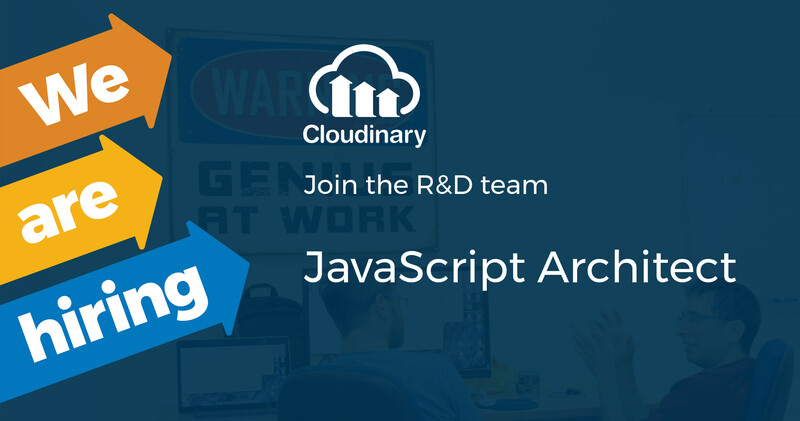 · Work with the community and our dev relations group to come up with innovative and productive JS solutions. · Collaborate with contributors from around the world to further enhance the SDKs. · Design and develop high quality showcase web apps that demonstrate Cloudinary’s technology. · Enrich the existing SDKs across multiple technologies & multiple environments. · 7+ years experience in software development. · Strong understanding of web technologies and architecture. · Working knowledge of RESTful API. · Continuous drive to learn new technologies quickly and independently. · Ability to handle all requirements from early phase to full implementation. · Great communication skills with tech and non-tech alike. · Fluent in English, both written and verbal. · Experience in multiple development frameworks and programming languages, such as Ruby, PHP, Python, .NET, Java, Scala etc. · Experience designing and implementing APIs or SDKs. · Experience with development, build, and integration tools, such as TravisCI, git, Maven, Gradle and grunt. · Experience in contributing to, maintaining and releasing open source libraries. · Experience working in an early-stage startup company. · B.Sc. in Information Systems Engineering or in Computer Science.